Some 800,000 years ago, a magnetic compass’ needle would have pointed south because the Earth’s magnetic field was reversed. These reversals typically happen every several hundred thousand years. The geomagnetic field is critical to life on Earth. Without it, charged particles from the sun (the “solar wind”) would blow away the atmosphere, scientists say. The field also aids in human navigation and animal migrations in ways scientists are only beginning to understand. Centuries of human observation, as well as the geologic record, show our field changes dramatically in its strength and structure over time. The discovery also will allow researchers to study the planet’s past with finer resolution by using this geomagnetic “fingerprint” to compare sediment cores taken from the Atlantic and Pacific oceans. Results of the research, which was supported by the National Science Foundation, were recently published in Earth and Planetary Science Letters. Yet in spite of its importance, many questions remain unanswered about why and how these changes occur. The simplest form of magnetic field comes from a dipole: a pair of equally and oppositely charged poles, like a bar magnet. “We’ve known for some time that the Earth is not a perfect dipole, and we can see these imperfections in the historical record,” said Maureen “Mo” Walczak, a post-doctoral researcher at Oregon State University and lead author on the study. “We are finding that non-dipolar structures are not evanescent, unpredictable things. They are very long-lived, recurring over 10,000 years – persistent in their location throughout the Holocene. While scientists are well aware of the pattern of reversals in the Earth’s magnetic field, a secondary pattern of geomagnetic “wobble” within periods of stable polarity, known as paleomagnetic secular variation, or PSV, may be a key to understanding why some geomagnetic changes occur. The Earth’s magnetic field does not align perfectly with the axis of rotation, which is why “true north” differs from “magnetic north,” the researchers say. In the Northern Hemisphere this disparity in the modern field is apparently driven by regions of high geomagnetic intensity that are centered beneath North America and Asia. “What we have not known is whether this snapshot has any longer-term meaning – and what we have found out is that it does,” said Joseph Stoner, an Oregon State University paleomagnetic specialist and co-author on the study. When the magnetic field is stronger beneath North America, or in the “North American Mode,” it drives steep inclinations and high intensities in the North Pacific, and low intensities in Europe with westward declinations in the North Atlantic. This is more consistent with the historical record. The alternate “European mode” is in some ways the opposite, with shallow inclination and low intensity in North Pacific, and eastward declinations in the North Atlantic and high intensities in Europe. The researchers were able to identify the pattern by studying two high-resolution sediment cores from the Gulf of Alaska that allowed them to develop a 17,400-year reconstruction of the PSV in that region. They then compared those records with sediment cores from other sites in the Pacific Ocean to capture a magnetic fingerprint, which is based on the orientation of the magnetite in the sediment, which acts as a magnetic recorder of the past. The common magnetic signal found in the cores now covers an area spanning from Alaska to Oregon, and over to Hawaii. The magnetic field is generated within the Earth by a fluid outer core of iron, nickel and other metals that creates electric currents, which in turn produce magnetic fields. 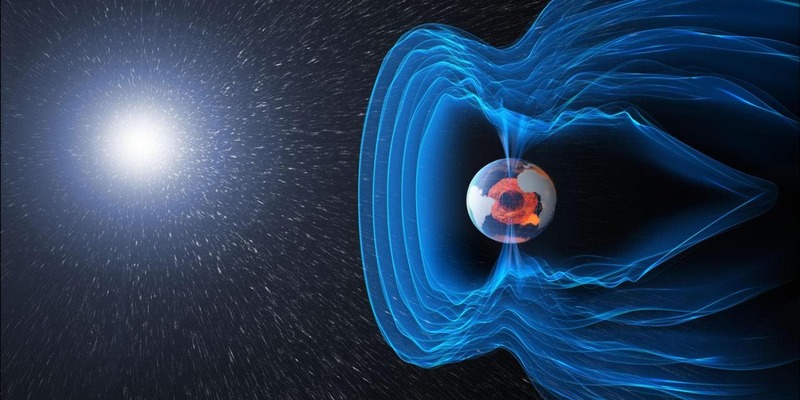 The magnetic field is strong enough to shield the Earth from solar winds and cosmic radiation. The fact that it changes is well known; the reasons why have remained a mystery. Now this mystery may be a little closer to being solved.